A collection of more than 90,000 rare manuscripts about the history and heritage of India's declining Parsi community has been discovered and is to be preserved. Many of the documents are hundreds of years old and written on slowly perishing materials such as tree bark. The Parzor Foundation, based in Navsari in the western state of Gujarat and set up under the auspices of the UN cultural organisation, Unesco, is undertaking the process of preserving and microfilming the texts. 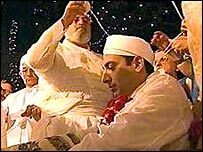 Parsis originally migrated from Iran and are followers of one of the oldest religions in the world - Zoroastrianism. The documents were discovered at the 131-year-old Dastoor Meherjirana Library in Navsari. They include the original Sanad of Emperor Akbar dating back to 1578, a document which agreed to give land to the first Dastoor Meherjirana. The head of the Parzor Foundation, Dr Shernaz Cama, told the BBC the documents showed the diversity and unity that existed in India at the time. "These documents include Arabic and Urdu and old Gujarati," she said. Dr Cama said it was essential that efforts were made to save them. "They deal with issues as diverse as astrology, astronomy, medicine, history, music. All sorts of topics. That's why they are so interesting and important to preserve," she said. The task - partly funded by the National Archives which contributed 300,000 rupees ($6,250) - forms part of the Preservation of Parsi Zoroastrian Heritage project. However Dr Cama explained that many of the documents were in poor condition and much more funding would be needed to preserve some of them, including the original Arabic and Persian texts. "Until we preserve them, we can't microfilm any of them. And these documents are on very rare material, including birch bark. "So we need to create an onsite preservation team at Navsari. And we need a lot of funding before we can create this team," explained Dr Cama. 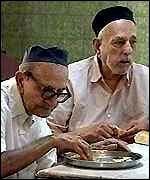 The Parsi population is declining and there are only around 75,000 Parsis left. The Navsari project is therefore seen as playing an important part in keeping the culture alive and the international support it is receiving is significant. Dr Cama explained: "The very fact that Unesco has realised the need to preserve and document this culture is a very important step."